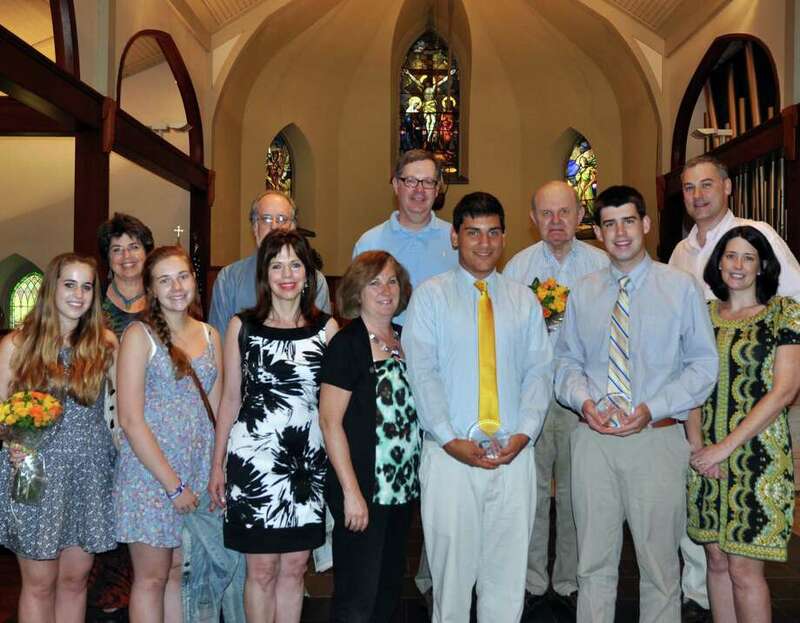 In a June 10 ceremony, the St. John Outreach Scholarships -- in memory of Therese Evers and Annette Kritzer -- were presented at St. John Church. This year, two high school seniors were selected as recipients based on their dedicated service to the community. Presenting the Annette Kritzer Memorial Scholarship were Rachelle Kritzer-Filipek, Germaine Kritzer-Koomen, both sisters of Annette Kritzer, along with their families. The Annette Kritzer Scholarship was awarded to Kyle Pasquarella, a senior at Darien High School, for his service to the church and community. As a member of the parish, Pasquarella was an altar server as well as a member/officer in the youth group. He has contributed to the community through his involvement with Safe Rides, Stamford Soup Kitchen and Boy Scouts, where he attained the rank of Eagle Scout. This fall, Pasquarella will attend Dean College, where he plans to study history. Presenting the Therese Evers Scholarship was Chuck Evers, father of Therese Evers. The Therese Evers Memorial Scholarship was awarded to Jay Alter, also a senior at Darien High School, for his service to church and community. As a member of the parish, Alter was an altar server and was involved with the annual restoration day and car wash. His contributions to the community include his extensive involvement with Challenger Buddy, a special education baseball program; Feed My Starving Children; Homefront Project; Bridgeport Rescue Mission; and the Darien Youth Asset Team. This fall, he will study sports broadcasting at Syracuse University. In January 1986, Therese Evers and Annette Kritzer, both members of the St. John Parish Community, died in unrelated car accidents. Therese was 15 and a sophomore at Darien High School and Annette was 21 and a junior at Oberlin College. Inspired by their personal generosity and example of service to others, a group of friends and parishioners established two scholarships in their memory dedicated to community outreach. The current award is $1,500 per scholarship.